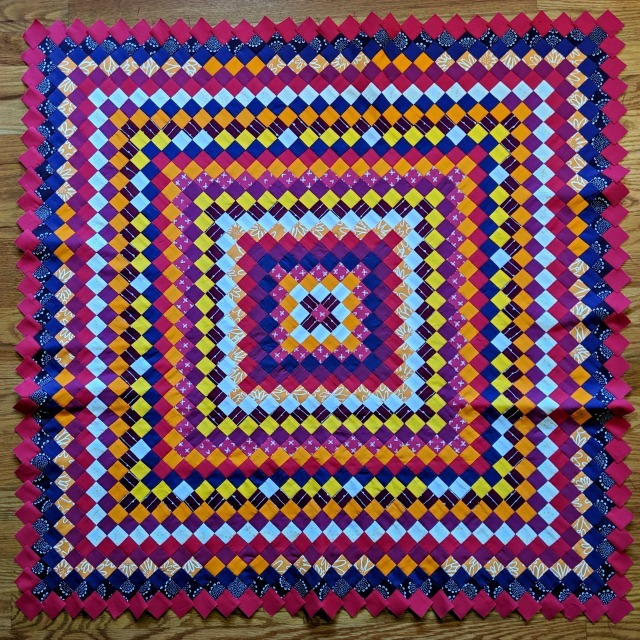 When it takes you nearly four months to sew on 'just' 108 little 1 1/2" squares, I think there's a subliminal message: It's time to move on. Yeah. My Teeny Tiny Trip Around the World that I started at QuiltCon in 2018 is now 38" square, and though I had thought I'd keep piecing on it indefinitely, it seems I've had a change of heart. I can accept that. My enthusiasm for hand-piecing it has waned, so it's time to say enough already and get to quilting. By hand, of course! Hand quilting is the only way if you've devoted all that time to hand piecing. You'll treasure this one after all the personalized stitches put into it! Such devotion! I love it! I don't have the patience for something that intricate, but I am glad you have it, because it is wonderful eye candy! It sounds like you have found the sweet spot. 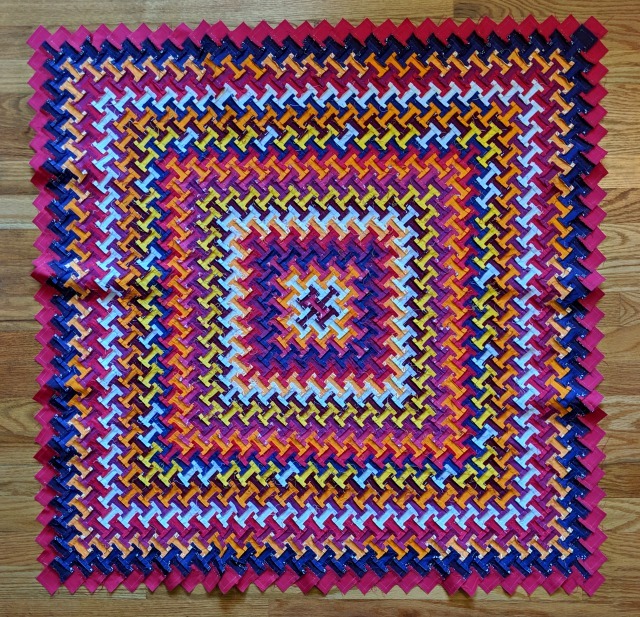 It looks great and I'm thinking that 38" doesn't sound too daunting for hand quilting, either! You're tenacious! I bet you learned a lot. I like the color contrast. Be proud of yourself for listening - to yourself and how the piece spoke to you. I think the size is great for a wallhanging - your personal beautiful artpiece! Wow - lovely! My hat off to you for hand stitching this lovely quilt! It is a great size. Wow. Beautiful on both sides. 4 month ago is a long time for one round! Can't wait to see how you quilt it! That was quite the adventure! Who says quilts don't talk to them! It's a gorgeous ending to a long and winding road. Like everyone else, can't wait to see how you quilt it! The quilt top looks amazing!